« I’m happy with my performance because I gave myself 110%. I could not do better today », Enrico Gasparotto said. The race was special due to the extreme weather conditions with wind, rain and slush. »During the race, I changed my clothes twice », the Italian explained. The team Wanty-Groupe Gobert didn’t have any rider in the breakaway but protected his team captain Enrico Gasparotto all the day. In the final, there were three hills with the Côte de Saint-Nicolas, the Côte de Naniot (new climb on cobblestones – 10.5% on average) and the Côte d’Ans, all gathered in the last seven kilometres. « I suffered on the Côte de Saint-Nicolas. In the Côte de Naniot, I was completely à bloc. 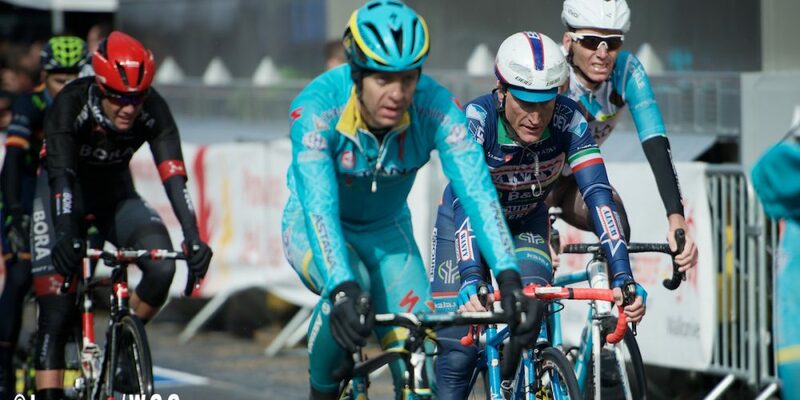 I tried to survive in the last kilometres », Gasparotto admits. For his first Liège-Bastogne-Liège as a pro rider, the Frenchman Guillaume Martin could finish the race. « I’m just glad I could finish the race. With this extreme weather conditions, it is already a victory for me », the winner of Liège-Bastogne-Liège U23 in 2015 thinks. Sports director Hilaire Van der Schueren is pleased with the strong performance of his riders. « It was a tough day for everyone. I was called at least twenty times for clothing changing. Enrico Gasparotto didn’t have any power left in the final kilometres, but gave everything to get a result. He had the right mentality. We rode very good classics. Some World Tour teams would be already happy with our results », Hilaire Van der Schueren concludes. Wanty-Groupe Gobert rounds off a very strong Spring campaign with a victory in the Amstel Gold Race, a fifth place in the Flèche Wallonne and a 12th place in Liège-Bastogne-Liège for Enrico Gasparotto. Next race: Le Tour de Romandie which takes place from Tuesday until Sunday in Switzerland. It is Wanty-Groupe Gobert’s first participation in this race.